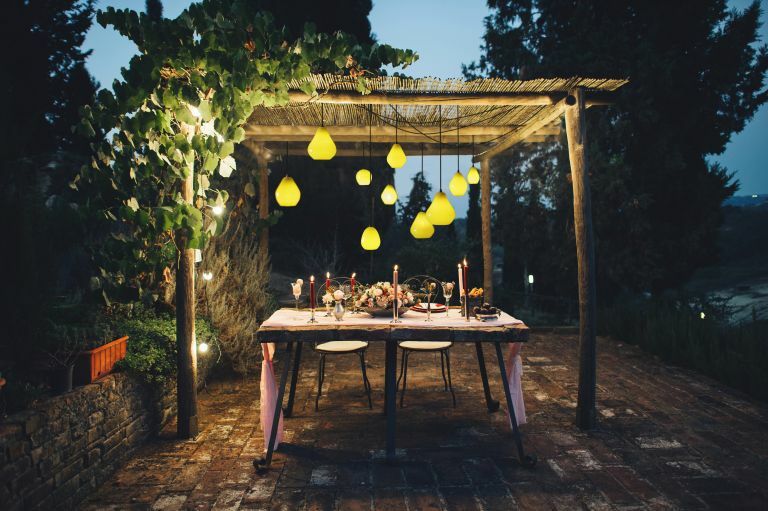 If you are looking to redesign your garden, then adding a pergola to your space can transform it and create a relaxing area for entertaining and al fresco dining or outdoor living. Follow this practical step-by-step guide to building a pergola and enjoy summer lounging in comfort (bring on the cool shade!) and style. 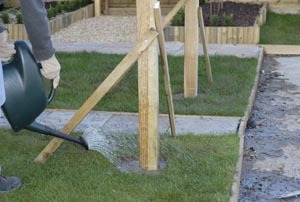 Head to our dedicated feature on designing a garden from scratch more garden-related advice and ideas. 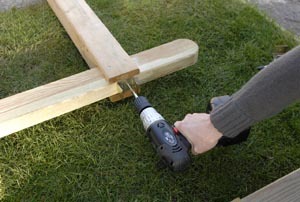 Then head to our dedicated DIY pages for more DIY advice. 1 Begin to assemble the pergola on the ground. Slot a rafter between the notches on two uprights. Leave an equal overhang on either side. 2 When these uprights are in place, secure through the notches marked on the uprights into the rafter. 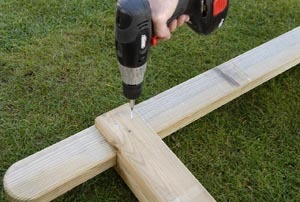 Use two 60mm screws on each side. 3 Turn section over and secure uprights in the same way from the other side. Repeat the process with another rafter and the two remaining uprights. 4 With both rafters secured, fix the U-shaped brackets to the centre of the top of each rafter with two 25mm screws per bracket. 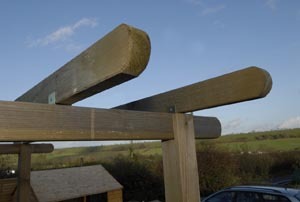 5 With a U-shaped bracket positioned centrally on top of each post, remaining brackets from the kit can be attached across the rafter. 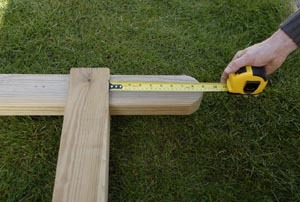 This kit includes six brackets for each rafter, but this number may vary. Here, four brackets are attached at equal intervals between the uprights. Do this on both sides, but lay the rafters opposite each other to ensure that brackets align and to make sure that the gap between uprights on each rafter is the same. 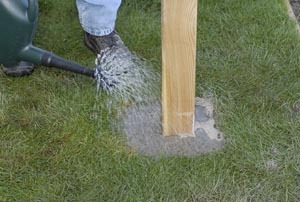 Small adjustments are best made now, rather that when the pergola has been erected. Some kits have notched rafters, so brackets are not used. 6 Define the line of the pergola with pins and line and space the two sides apart as instructed by the manufacturer, which is dictated by the length of the cross rafters, allowing for an overhang on both sides. Here, the pergola will be running over this paved path, so positions must be marked both sides. 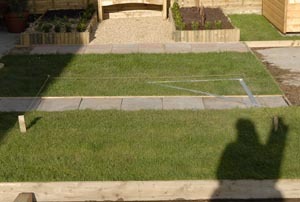 A large square is helpful in measuring out the layout accurately. According to how far apart your uprights are, mark positions for all four. Use the square to ensure that you are creating as perfect a rectangle as possible with your pinned lines. 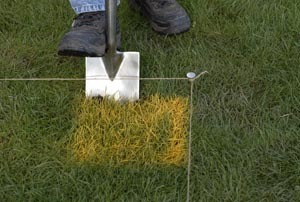 Mark the positions of the uprights with a coloured aerosol spray. It is important to be as accurate as possible. When you lift the uprights, you will still have some room for a little final adjustment. 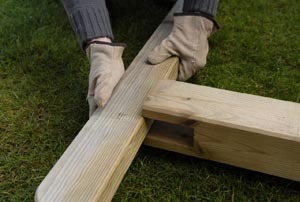 7 If the pergola is to be secured by sinking the uprights into the ground, dig holes for each of the four uprights that are no less than 60cm deep and 30cm square. 8 Pour gravel to a depth of about 10cm, into the bottom of each hole, before planting the uprights of the completed sections and packing gravel around them. 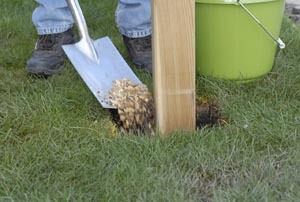 9 Fill the hole to the top with ready-made post mix, tamp it firmly around the posts with your feet. 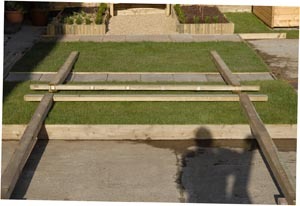 Water in the fast-drying post mix, following the manufacturer’s instructions. 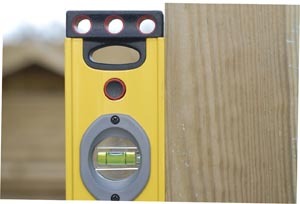 10 It is very important to constantly check, with a long spirit level, that all your posts are vertical, and that the opposing sections/rafters are all at the same height to ensure a solid structure. 11 Nail wooden battens to each of the posts so that they remain securely upright while the post mix sets. This time will vary with different mixes. 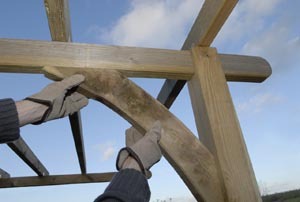 12 Place the remaining rafters into the U-shaped brackets with an equal overhang either side. Secure all through the U-brackets, either side, with two 25mm screws. 13 Finally, position a curved brace at each corner so that the braces are flush with the upright and supporting of the rafters from underneath.